1) Sri Bhoga Srinivasa, 2) Ugra Srinivasa, 3) Koluvu Srinivasa, 4) Sri Malayappa, 5) Sri Krishna, 6)Srirama, Sita, Lakshmana and Sugreeva and 7) Sri Chakrattalvar. 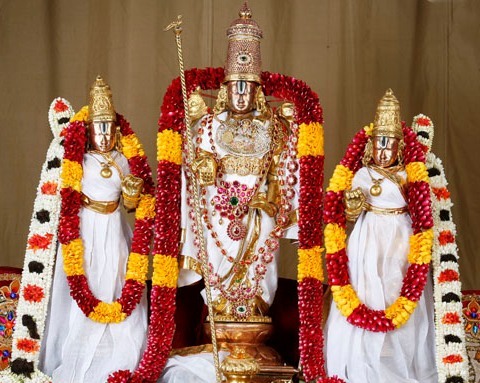 Each idol has their own significance and importance during daily sevas, annual festivals and in religious rituals apart from main deity of the Tirumala Temple. 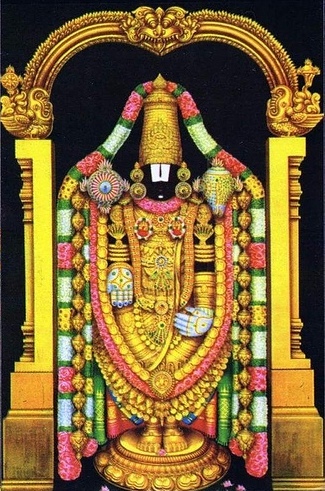 Sri Bhoga Srinivasa Idol is a true copy of the Dhruva Bera(Main Deity) except that the Sanku and Chakra are permanently fixed in the case of Bhoga Srinivasa. Sri Bhoga Srinivasa gets Abhishekam every morning unlike the Dhruva Bera to which Abhishekam is performed only on Fridays. Ekanta Seva is performed to Sri Bhoga Srinivasa. 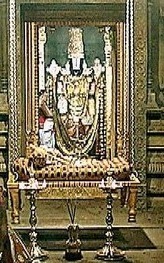 During Ekanta Seva, Sri Bhoga Srinivasa is placed in a Silver Cradle in the Sayana Madapam and offered milk to Sri Bhoga Srinivasa. Sandalwood paste is also offered to him every night. Ekanta Seva is performed to Sri Bhoga Srinivasa for all months in a year except Dhanurmasam in which Ekanta Seva is performed to Sri Krishna. This idol is made of Silver and was consecrated by the donar, the Pallava Queen, Samavai in 966A.D. The donor's consecration is recorded in an Epigraph on the northern wall of the Temple Prakaram which is perhaps the earliest inscription in the temple. This idol was once originally called as Venkatatturaivar and stands for the anger aspect of the Lord Sri Venkateswara. Hence he is called Ugra Srinivasa. Apart from the Dhruva Bera (Main Deity), this is perhaps the earliest idol of the temple and this was used as the processional idol in the very early days. The idol is about 7 inch height. Sridevi and Bhudevi both as standing figures are also seen. Legends say that the rays of the Sun should not touch this idol and if they do, it would bring incalculable harm to the world. Every day after the morning Thomala Seva, a darbar called Koluvu is held in the Tirumamani Mantapam where the deity is brought and is seated in a silver chair with a gold umbrella above him. 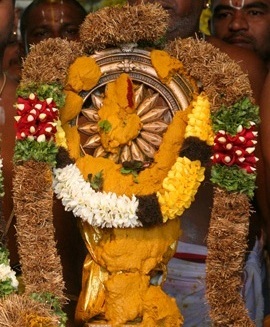 This idol officiates for the main idol during this function and hence his name is Koluvu Srinivasa. He is akin to the guardian deity and supervises the temple household, and keeps himself posted with all the affairs and revenue of the temple. The Panchangam or the Calendar of the day is also read out before Koluvu Srinivasa Every Day. The first mention of this deity under the name "Malai Kuniya Ninra Perumal" is found in an Epigraph about the year 1339AD. The idol is in a Standing Pose and is a replica of the Dhruva Bera(Main Deity). The two upper arms hold the Sanku and Chakra, the lower right arm is in the Varada hasta pose and the left arm in Katyavalambite pose. This image has a very rich treasury of precious gems and jewels made of Platinum and Gold. The idol of Lord Malayappa is about three feet height and stands on a lotus pedestal on a platform about 14inch height. To right is the idol of Sridevi about 30inch height. Sridevi left hand is in the Kataka hasta pose, the right is in the Gajakarna pose. To left is the idol of Bhudevi which is in standind pose. Bhudevi left hand is in the Gajakarna pose, the right is in the Kataka hasta pose. 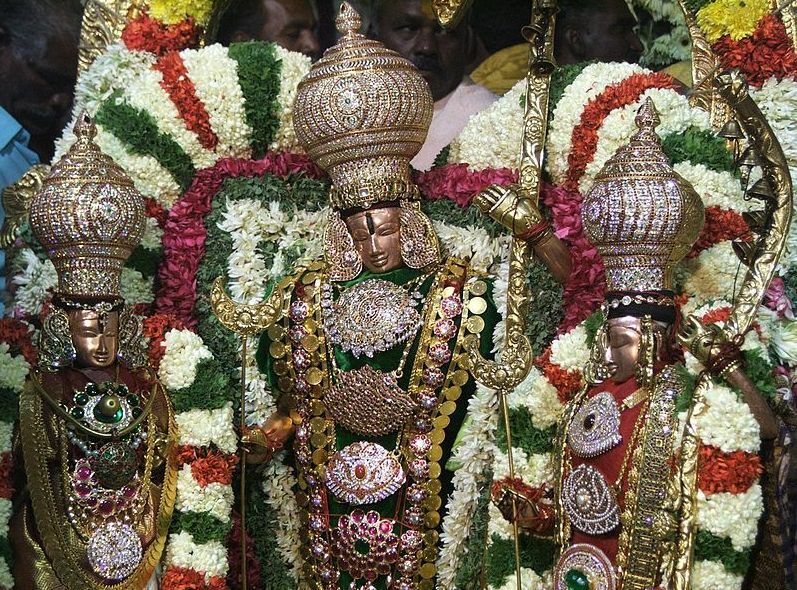 In the order of preferences the idols that represents the Dhruva Bera are Bhoga Srinivasa, Sri Malayappa and his two consorts, Ugra Srinivasa and Koluvu Srinivasa. In the Garbha Griha there is a very beautiful idol of Lord Krishna in the Navarutha nritya pose along with his consort Rukmini. The Lord is shown as a dancing child on his left foot on a lotus pedestal, the leg gracefully bent at the knee and not resting on the pedestal. The right hand holds butter, while the left hand is stretched out gracefully in a dancing pose. The earliest inscription reference to this idol is of 1100A.D. Sri Krishna idol receives Ekanta Seva at night in the temple during Dhanurmasam[December/January]. Neither the idol of Sri Krishna nor of Sri Rama(called as Raghunatha) enjoy daily puja. Four copper idols of Sri Rama(also known as Sri Raghinatha), Sita, Sugreeva and Lakshmana find place in the Sanctum Sanctorum. The idol of Sri Rama is in the Madhyama(middle) and tri bhanga pose, the left arm raised to hold the bow and the right arm gracefully sloping downwards as if to hold the arrow. Goddess Sita is the right of Sri Rama in a standing pose, her right hand gracefully extended downwards, the left hand holding a lotus bud. The idol of Lakshmana is a similar replica of the idol of Sri Rama. The idol of Sugreeva is in the standing pose and hands folded in an attitude of prayer. This deity always precedes the Utsava Murthi in processions. He however figures in separate procession on the Ankurarpanam and on the Tirthavari day(Chakra Snanam) of the Brahmotsavam.